Ten people in the South Indian state of Kerala have died after being infected by the Nipah virus, an emerging disease thought to be spread by fruit bats and other animals. Here’s what you should know about the outbreak. 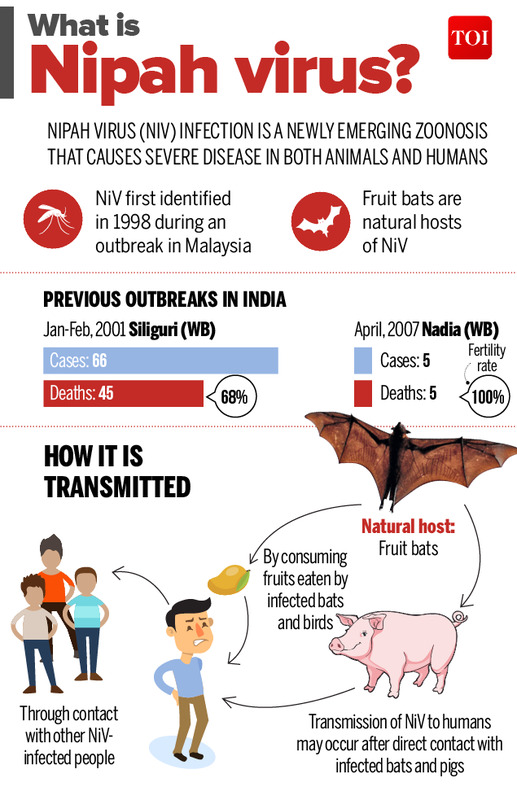 The Nipah virus is a highly contagious and deadly virus that was first identified in 1999 when pig farmers in Malaysia and Singapore became very sick. During that outbreak, nearly 300 people were infected, and more than 100 people died. To stop the outbreak, authorities had to euthanize over one million pigs. Since then, the virus has been identified in outbreaks in Bangladesh and India. TheU.S. Centers for Disease Control and Prevention (CDC) says that outbreaks of Nipah virus now occur in Bangladesh almost every year, and there have been several outbreaks in India prior to the current one. The death rate from the Nipah virus is estimated to be about 75%. The virus is spread to humans who have direct contact with animals that are infected, like fruit bats or pigs. It can also spread between people, often between family and caregivers of people who are infected. 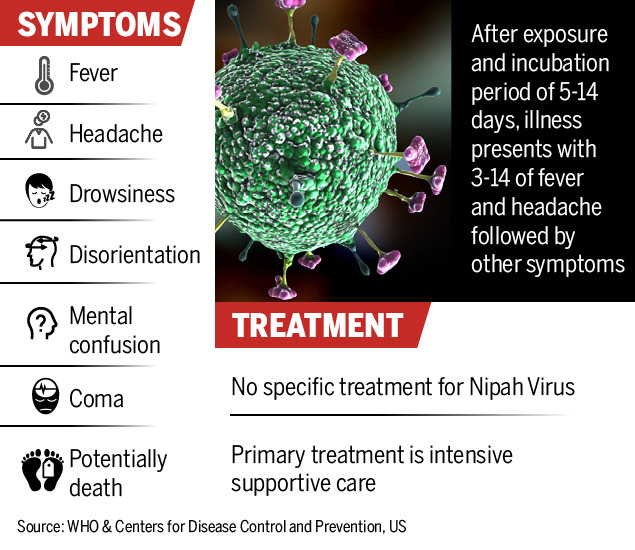 When a person is infected with the Nipah virus, they experience encephalitis, or inflammation of the brain. It typically takes five to 14 days for symptoms of an infection to start to appear. These symptoms include fever and headaches that are followed by drowsiness and confusion. It’s then possible for the symptoms to progress to a coma. The CDC says long-term side effects among survivors can include convulsions and personality changes. How is the Nipah virus treated? There is no cure for the Nipah virus. Instead, people who are infected are treated with supportive care, which includes making sure the person stays hydrated, and treating any nausea or vomiting. People can take steps to prevent Nipah “by avoiding exposure to sick pigs and bats in endemic areas and not drinking raw date palm sap,” which can be contaminated by excretions from infected bats, the CDC says.